Being plain dwellers lions are the easiest of all the big cats to observe. I have often watched groups of up to 30 lions, from newborn cubs to full grown males, lazing under bushes and trees. Unlike other big cats, which live and hunt alone, lions gather and hunt in prides. Males are much heavier than females so often the task of hunting falls to the lionesses. 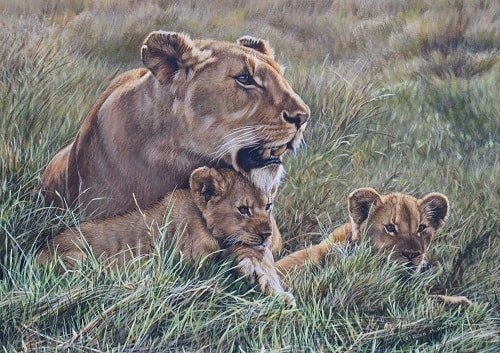 Lions often hunt at night so to actually witness a kill is quite rare but you can quite often see them finishing off their spoils early morning..
​A beautiful collection of original lion paintings by internationally acclaimed wildlife artist Alan M Hunt. The lion is a magnificent animal that appears as a symbol of power, courage and nobility on family crests, coats of arms and national flags in many civilizations. Lions at one time were found from Greece through the Middle East to northern India, but today only a very small population remains in India. In the past lions lived in most parts of Africa, but are now confined to the sub-Saharan region. Mature male lions are unique among the cat species for the thick mane of brown or black hair encircling the head and neck. Both male and female lions roar, a sound which can be heard as far as 8 km away. The lion is an exception to the usual solitary existence of most cat species. It has developed a social system based on teamwork, division of labor and an extended but closed family unit. The average pride consists of about 15 individuals: 5 to 10 females, their young, and 2 or 3 territorial males. These are usually brothers or pride mates who have formed a coalition to protect their females. Because a nursing lioness will come into heat a few weeks after the loss of cubs, males with newly won prides will often kill existing cubs, enabling them to sire their own. When resting, lions seem to enjoy good fellowship with lots of touching, head rubbing, licking and purring. Cooperative hunting enables lions to take prey as large as buffaloes, rhinos, hippos and giraffes. However, scavenged food provides more than 50% of their diets—lions will often take over kills made by other carnivores. Females do 85-90% of the hunting, usually by setting up an ambush into which they drive the prey. The kill is not shared equally within a pride, and at times of prey scarcity, high juvenile mortality rates occur, as hungry females may not even share with their offspring. Lions have long been killed in rituals of bravery, as hunting trophies, and for their medicinal and magical powers. Habitat loss and conflicts with humans are the lions greatest threat. Currently, AWF has lion conservation research projects in Tanzania and Botswana. Little is currently known about where lions go outside of national parks, what they do and what types of threats they face. With a growing human population surrounding parks, there are an increasing number of encounters with humans. A collection of graphite pencil studies by Alan M Hunt. click here to see more wildlife sketches. Found in these Heartlands: Kazungula, Kilimanjaro, Limpopo, Maasai Steppe, Samburu, Zambezi. Habitat: Lions are found in savannas, grasslands, dense bush and woodlands. Although the male lions is quite a bit larger than the female lion, the female lion does most of the hunting. The male lions then take what they wish from the hunt. Any cubs get the leftovers. Lions often feed on zebras, wildebeest and can amazingly take down large animals such as giraffes, hippos and even young elephants. At the other extreme, they will also eat mammals the size of mice. When males take over a pride, they usually kill the cubs. The females come into estrus and the new males sire other cubs. They are large animals, the males standing at 1.2m tall, and the females 90cm tall. The male lion weighs a solid 190 kilograms, and the female 130 kilograms. Apart form the size difference, you can tell the difference between male and female lions by manes. Only the male lion has a mane, which can range from sandy brown to almost black in colour. They hunt together in groups called a pride, with many lions working cooperatively to bring down one large animal. 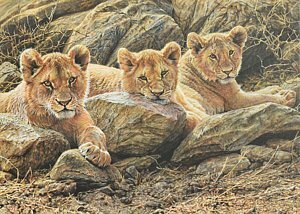 Available as UNSIGNED Prints: Lion Art Prints, Photorealism Lion Prints, Fine Art Lion Prints, Realism Lion Prints, Acrylic Lion Prints, Lion Art Print, Canvas Lion Prints, Greeting Cards, Throw Pillows, Tote Bags, Phone Cases and much much more with Lions. These Lion Prints are available with various finishes such as acrylic, metal and wood. And sizes including ​6.00"x 8.00" 7.50"x 10.00" 9.00"x 12.00" 10.50"x 14.00" 12.00"x 16.00" 15.00"x 20.00" 18.00"x 24.00" 22.50"x 30.00" 27.125"x 36.00" 30.125"x 40.00" 36.125"x 48.00" 45.125"x 60.00". Visit Alan's Lion and Animal Art Shop. 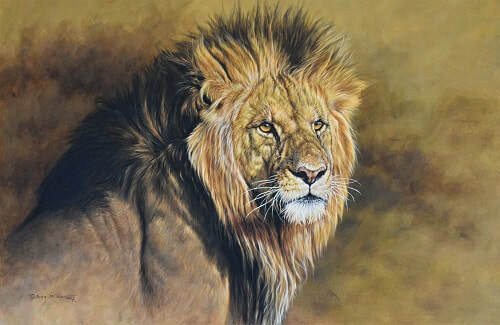 Or view all of Alan's Lion paintings and prints that are available by clicking here https://alanm-hunt.pixels.com/collections/paintings+of+lions or on the lion images below.